Until I find a way to create a custom donation section, with Paypal, I am only able to stack vertically the different donation amounts. 4) connections: perhaps you can put me in contact with one or more of the people listed at the bottom of this section, whom throughout my life have influenced and inspired me. click on the above: For every donation of $ 2,500.00, you receive the following: ( 7 day ) stay in ( 1 ) apartment for ( 2 ) people, includes meals. click on the above: For every donation of $ 5,000.00, you receive the following: ( 14 day ) stay in ( 1 ) apartment for ( 2 ) people, includes meals. click on the above: For every donation of $ 10,000.00, you receive the following: ( 1 month ) stay in ( 1 ) apartment for ( 2 ) people, includes meals. I am sourcing a company to produce items to buy directly from this website. I will offer various items for sale: pins, wrist bands, t-shirts, and hats. If anyone reading this can help put me in contact with a manufacturer for these items, I would greatly appreciate it. Otherwise, I will add them to this site for purchase as soon as I get them produced. In the meantime, I can offer the following: if you donate the following amount through the DONATE button above, and if you are interested in receiving the following item, please go to the last section of this site ( contact ) and send me your name and address where I can ship it to you, and as soon as I get the pin, wristband, t-shirt, and hat produced, I will mail it to you. The logo I designed, which consists of a black circle ( completely black inside ) with a small round white object inside, not only representing my foundation: a Brain Tumor and a Dream, but even without the words, the logo represents brain tumor awareness. The inner white object, directly represents a brain tumor, and on a deeper level, an object with uncertainty, floating in the vastness of the universe. products, which I have designed, products by designers whom I have invited to design a specific product for sale only through this site, and products which various manufacturers have donated. I will list them as they become available. limited editions of: furniture ( editions ranging from 5 – 25 ) , ceramic / table objects ( editions ranging from 100 – 250, such as my ashtray design “NIKI” which Starck produced ( see design section ). I will most likely offer it in bronze. I am currently getting pricing for a new occasional table design of mine, which I will offer in an edition of 25.
limited edition artwork prints ( of my own, and by selected artists ). I will be soliciting companies such as Alessi, IKEA, CB2 ( crate n barrel ) to produce my designs, and sell through this site ( high quantity volumes, verses limited editions ). I will also be offering one of a kind original artwork, in the form of drawings, watercolors, paintings, sculpture, as artists donate them ( if I do not hold on to them for a benefit auction which I am curating and will have at an auction house in either NYC or Chicago ). It is all very exciting! I will offer what I can as everything becomes available. At the end of this section, I have listed artists, singers / musicians, composers, actors, directors, comedians, other personalities and inspiring people, whom throughout my life have influenced and inspired me. If you ( whom are reading this ) can put me in contact with, or have any of them contact me, this would be a wonderful contribution, because: First, I would love to thank them for their inspiration. Secondly, ask them if they may be able to contribute to my foundation in one of several ways, ex: a donation of an item of their artistry, or a fundraising event involving them. I hope you enjoy the following products. Your purchase will help support this foundation. I am proud to offer this product on this site, because it is this leashes' Worldwide debut. I have designed every detail of this leash, and spent 3 years developing this leash in coordination with a manufacturer of climbing carabiners and rescue harnesses. All materials are of the highest quality, literally indestructable. All hardware is cast, Non corrosive ISO Naval Bronze, for superior strength, and beautifully polished. The leash material is Dyneema, a soft to touch material which bullet proof vests are made out of. The Dyneema manufacturing process creates a material twice as strong as hardened steel. You can say that this leash is bullet proof. If your dog chews on it, their teeth will not penetrate nor destroy the Dyneema. 1) Instead of offering different leash sizes, this leash adjusts to any length between 59" and 36", which makes it perfect for a dog which you are training with a shorter leash length and would like close to your side, and for those who will allow their dog more leash length. 2) The sliding clip slides effortlessly along the Dyneema, and due to the orientation of the two loops, the Dyneema is "pinched" when the leash is taught, so the leash length will not change. 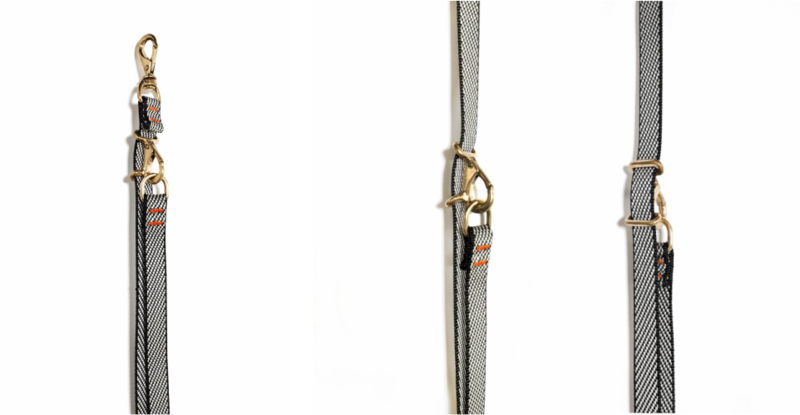 When the dog is at rest, and the leash is slightly slacked the sliding clip does not move, but does allow the user to slide the clip effortlessly along the Dyneema, to change the leash length. The sliding clip is impeccably polished so that it will not fray the Dyneema as you slide it, to adjust the leash length and diameter of the loop. 3) The minimum diameter loop is 6" ( which is the handle when the leash is at its maximum 59" length ), which you can secure your dog to a parking meter, and as you slide the clip along the Dyneema the diameter of the loop becomes larger, maximum apr. 20", to secure your dog to a tree in the park. 4) The stitching is not only beautiful, but rated at the highest of International climbing requirements. Climbers feel safe hanging from rock faces, so no problem in securely walking your dog. You'll never need another leash - unless you get additional dogs." Shortly before my tumor diagnosis I finished the final development of this leash, but then I experienced a 2 year hiatus from my personal and professional life due to my tumor recovery. Now, I can move forward, and listing my dog leash on this site is its' Worldwide debut. The minimum initial production run is 400 leashes, so I need 400 leashes purchased, then I can commit to the production run. Once I commit to the production run, I will have all 400 leashes in hand in 60 days, to begin mailing them to all whom purchased. I thank you for your support in advance, and know you will love this leash, and agree that it is of the highest quality of design, materials and manufacturing, as in the reputation of all my products. I appreciate not only your support by purchasing a leash to benefit this foundation, but your trust knowing that your leash will arrive apr 60 – 90 days after 400 leashes are purchased. So make sure you supply your shipping address with your purchase information. Even email me at: larrylaske@abraintumorandadream.org. 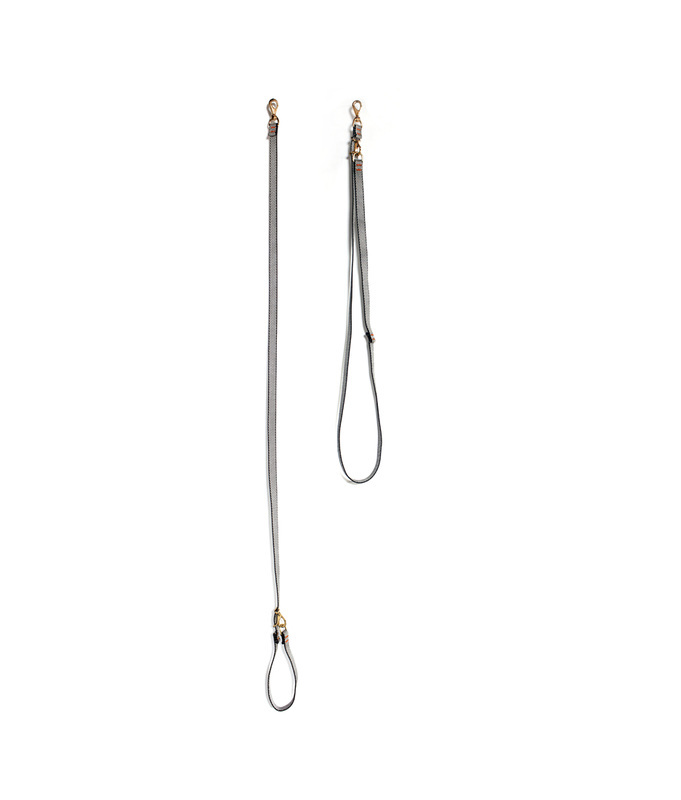 An enormous help is if you know of a retailer, boutigue, or distributor whom you feel may carry my leash. If so, please go to ( contact ) the last section of this site and email me such helpful information. Also, feel free to call me. Apart from the store on this site, I am offering for sale: all rights to the following the ( 2 ) products I have designed and developed. Both have been tooled, manufactured and sold by me, at one period of time. My focus now is on this foundation, and selling all rights, patent, and tooling to these products, in order to help fund this foundation. Please go to the website to see the entire product and packaging. Since I introduced this beach chair in 2008, I have sold several thousand chairs through this website, a few retailers, such as DWR, and two very successful FAB.COM sales ( July 18, 2011, and August 20, 2012 ), and several design focused mail order magazine. On May 21, 2012 2012 there was a wonderful mention in Forbes magazine. Please return to the ( design career ) section of this site, scroll down to this beach chair, to see the ( 5 ) major International design awards it won. It swept all 5. I have done this all through my own effort. A distributor is needed. I am currently sourcing a towel manufacturer, to produce the sleeve and a sleeve towel combination, made out of 100% cotton, or terry clothe. The sleeve has two functions: 1) it acts as a perspiration absorber. When the user rests against the plastic, there will be some perspiration due the plastic being in the sun. 2) one side of the sleeve ( which will be located on the back side ) is a great promotional idea, because silk screening, or embroidering, a logo or company information on the sleeve, will act as a billboard to all the passerbys on the beach. I can email you a pdf of the prototypes for the sleeve and sleeve towel combo. This is a great idea for an exclusivity for a Cruiseliner. The chair can be purchase in their onboard store, and they can give out a sleeve as a gratuity, or charge very little to cover the manufacturing cost, and their logo…can be one of many little billboards on the beach. The Master Carton is designed to display ( 10 ) chairs in the retail environment. Perfect for a small onboard Cruiseship store. Perhaps, someone reading this has a contact with a cruiseliner, whom I can solicit this chair, and license it as an exclusivity. If I am able to license this chair, then my hands are free, and I can generate monies for this foundation, otherwise I am interested in the sale of all rights to this beach chair: intellectual property, patent, tooling ( which also includes all the packaging tooling ). I am open to any discussion. Don’t ask me why I came up with this name for this particular site. The product on the site is a plant stand. I designed it so that plants can be raised off the floor, and able to receive sunlight through the windows. I just finished the initial manufacturing run, and then September 11, 2001 ( 911 ) happened. The caution and uncertainty which followed affected us all. I had great response to my product and orders with several retailers, and garden centers, but post 911 made it more difficult to sell my plant stand, mainly because I was manufacturing it in Grand Rapids Michigan ( where I lived at the time ) and it was just too expensive. In June 2002 I moved to Italy, focusing on designing and developing products and furniture, so this plant stand was removed from my mind. I have the tooling for: the base, the pot, saucer, and plate, which I have stored in a warehouse since 2001. I had all the tooling produced in Grand Rapids, which from my memory was apr. $ 70,000.00 in total. I would like to sell all rights to this plant stand: intellectual property, tooling, at a ridiculously low price, so that I can put the monies into this foundation. Throughout my life, the following people have influenced, and inspired me. If you ( whom are reading this ) can put me in contact with, or have any of them contact me, this would be a wonderful contribution, because: First, I would love to thank them for their inspiration. Secondly, ask them if they may be able to contribute to my foundation in one of several ways, ex: a donation of an item of their artistry, or a fundraising event involving them. Directors I would like to pitch a movie idea which I wrote back in 2001, and as every year passes, my film idea seems more relevant than the prior year. Comedians I mentioned in the prior section ( and a Dream ), the idea of organizing a fundraiser, “Humor for Tumors”. Chefs I am sure any of these 3 chefs would welcome a chance to cook in my restored church in Sicily. I would love to organize cooking seminars with them, and I am open to any of their suggestions. I would like to solicit a few PGA tour golfers, asking them to wear my logo. The more exposure, the more awareness. I have enjoyed watching those below, and hope they may be open to wearing my foundation logo, even if simply a 1” dia. circle ( on their hat ). Skiers ( in order through my teenage racing days to present ). All were inspiring to my love of downhill skiing. I especially remember being 13 years old, sitting on the edge of couch, glued to the TV and moving with every turn as Franz Klammer won his 1976 Olympic gold medal. I still tear up as I watch it. I have had some amazing downhill runs since then, and crashes, but it was at that moment I wanted to be a downhill racer. Stenmark and Zurbriggen were amazing technicians, and Bode Miller ( a dream of mine to have lived and trained in Austria ). Hermann Maier actually retired the last year I was living in Austria. It was incredibly special ( and a lifelong dream for me ) to be in Kitzbuhel to experience the Hahnenkamm live. As a result of living in Austria, in January 2009 my dream was realized. I was in Kitzbuhel for the Hahnenkamm. Special enough, but even more special because Bode Miller raced, and it was the last Hahnenkamm for Hermann Maier, before his retirement. and not to forget: Georges St-Pierre to have my foundation name and logo on his fighting shorts would be unbelievable. Perhaps he will donate one of his fighting shorts which he wore during a championship fight.